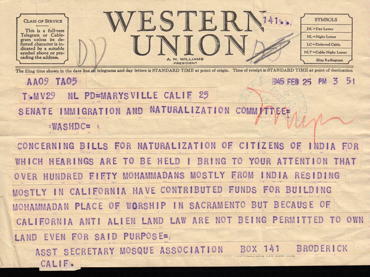 Western Union telegram sent to the United States Senate Committee on Immigration from the assistant secretary of a mosque association (name unknown) in Broderick, California. The author expresses support for legislation to naturalize citizens of India by noting the hardship imposed by California’s “anti alien land law,” which prevented “one hundred fifty Mohammedans” from building a mosque in Sacramento. 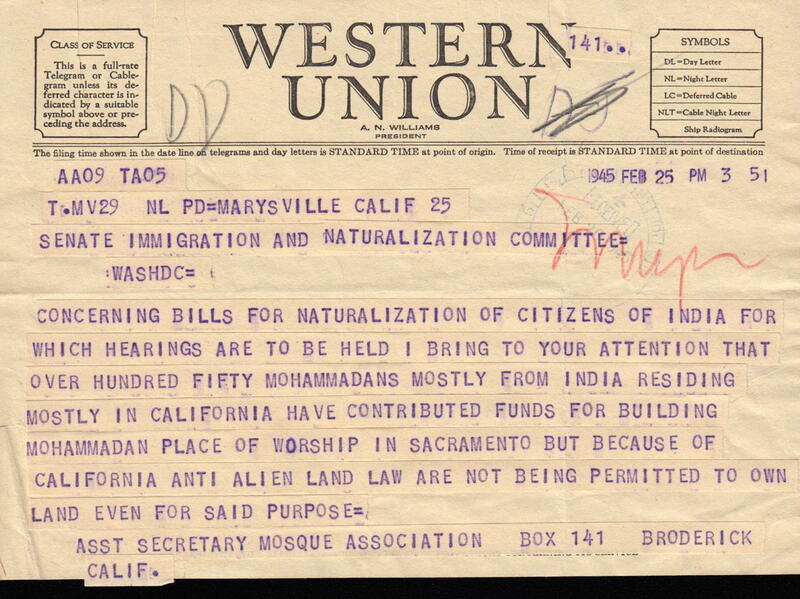 The telegram became part of the Senate Committee on Immigration's records regarding S.236, a bill that would permit all people from India residing in the United States to be naturalized. Holding Institution: National Archives Building, Washington, D.C.
* This digital object may not be sold or redistributed, copied or distributed as a photograph, electronic file, or any other media without express written consent from the copyright holder and the South Asian American Digital Archive (SAADA). The user is responsible for all issues of copyright. If you are the rightful copyright holder of this item and its use online constitutes an infringement of your copyright, please contact us by email at copyright@saada.org to discuss its removal from the archive. There are 3,670 unique items available online in SAADA.